High capacity trimmer that cuts matboard! Dahle's Premium Rolling Trimmers are designed for heavy duty applications. Whether you are cutting matboard or a single sheet of paper, you can expect to receive the same burr free cut each and every time. This cutting capacity is made possible by a thick walled square aluminum guide rod which provides maximum strength with minimal side movement of the cutting head. Floor stands are available for the two larger sizes or the trimmers can be placed on a table or mounted on the wall. Dahle Premium Rolling Trimmers are available in 14", 20", 26", 36" and 51" cutting lengths and are a popular choice among professional photographers, picture framers, and print and copy shops. The roller blade cutter arrived last week & I am very pleased with its performance. It seems to be a sturdier version of the old one I had for over 30 yrs. which had cut a multitude of pictures for the Bible Texts that we put together that go world wide. The pictures get glued on cardboard with a Bible verse, a border is drawn on with magic markers in a corresponding color; then it gets laminated & after the edges are trimmed, we get them back to punch a hole & our mentally challenged daughter puts a yarn tie on each one. For the past few years I have been cutting laminated bookmarks on the cutter--been doing 20,000 on the average each year; so the cutter gets well used. Thanks for your help in getting a good product to me. This is the Dahle Model 442 Premium Rollin Trimmer! On the top are guides to common paper sizes and other angles. The squares throughout measure 1 centimeter by 1 centimeter. There are inch measurements on the side, too. And there is a convenient lip that catches the smaller trimmings. The rolling head snaps into place on both sides of the trimmer. When the blade passes, it pushes down on the clear paper clamp and helps secure your pages when cutting. It comes with an edge guide to place your pages against. You can remove this as well and place it anywhere—there are magnets to help keep it in place, too. And you can use it on either side of the cutter. Many trimmers derail when you try cutting too many pages—I overloaded this one, and it still cut through all of them! That is one of the best tests for a good trimmer, and this one passed. Of course, it’s always recommended to cut not cut more pages than 30 sheets, and less usually produces even cleaner cuts. Dahle is the German-based manufacturer of some of the best office tools money can buy. One of their premium rolling trimmers is the 442, which is definitely worth a look if you need such a device. Here's some information about it, as well as how it rates on a 1 to 10 scale. The Dahle 442 has a remarkable cutting capacity for a rotary trimmer. It can slice through as many as 30 sheets at a time, making it perfect for jobs both large and small. This cutting capacity is based on 20 lb. bond paper, so you might be able to cut more if the paper you're working with is thinner. This trimmer is strong enough to cut through mat board and cardstock. This makes it good to have around if you work with these types of materials. Whatever you're cutting, it can be up to 20-1/8 inches long. The Dahle 442 has a very strong blade that can cut in both directions. The blade is self-sharpening and made out of ground steel so not only will you get a lot of use out of it, you'll never have to worry about maintaining it. Although this trimmer has a strong blade, it's actually pretty safe to use. That's because the blade has been placed in a plastic case so you won't accidentally cut yourself while using it. One of the most innovative things about the Dahle 442 is that it can be mounted on the wall. This could come in handy if your workspace is rather cluttered because this is a big trimmer. It measures 28" x 15-1/8" so being able to get it up and out of the way is definitely a plus. You can expect a clean, burr-free cut whenever you use the Dahle 442 because the cutting head is mounted on a solid aluminum guide rod. The cutting head won't move from side to side very much, thus resulting in a crisp cut. This device comes with an automatic paper clamp so your materials will stay steady as you're working with them. It also comes with an adjustable backstop that can be placed on either side of the base. This feature enables you to keep your paper flush when cutting it. The Dahle 442 has a metal base that's really durable. The base even has an alignment grid printed on it, as well as cutting guides and a protractor. (The protractor is for making angled cuts.) There are both metric and standard measurements on the grid for your convenience. Finally, this cutter is backed by a limited lifetime warranty. Final rating: 9. 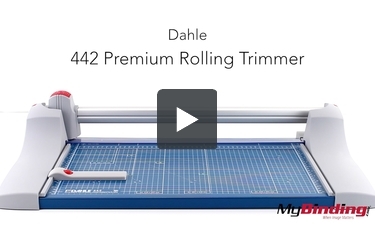 If you're looking for one of the best rolling trimmers available, you can't go wrong with the Dahle 442. This device has it all, from an excellent cutting capacity to high-quality construction. It's even durable enough for frequent use and you'll stay safe when using it. If all of this is appealing, then be sure to check out the Dahle 442 today to see firsthand what it can do. how many sheets of 80# card stock with this cut at a time? Great question! So this machine is actually measured for 30 sheets of 20# paper. If you were using an 80# card stock, you would probably not want to do more than 3 to 5 sheets at at time. Using at max capacity will wear a cutter down very fast. We suggest always going lower which is why we suggest 3 to 5 at a time.